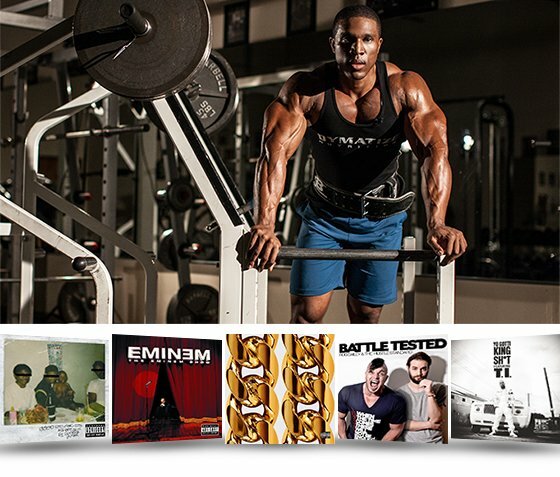 Need some new gym music? Here's Lawrence Ballenger's excellent playlist. Log into Spotify and download some new tunes! Lawrence Ballenger is one badass dude. At 6 feet, 250 pounds, his intimidation factor is off the charts. But don&apos;t be fooled by this gentle giant. Lawrence is also one of the nicest, friendliest people you&apos;ll ever meet. The NPC physique athlete is a student, fitness model, and personal trainer. Despite his busy schedule, Lawrence has managed to make his great physique even better. He lifts hard and heavy to put on lean mass and chisel that coveted X-frame. If you think physique athletes don&apos;t train legs, a squat session with Lawrence will change your mind. Here&apos;s his awesome playlist. The mix of genres is sure to get you pumped, no matter what you usually have blasting in your head phones. What&apos;s your favorite body part to train and why? Training legs has to be by far my favorite part to train because there are so many different exercises to do. There is no feeling like when you are done training your legs and you have to walk downstairs to get to your car. I never feel more accomplished than when I&apos;ve totally demolished my legs. What do you do to get motivated to hit the gym hard? One thing I like doing is going on We Mirin&apos; on Bodybuilding.com and check out other great bodies. I also love looking at old-school classic physiques like Serge Nubret and Frank Zane. Those guys motivate me to push harder to achieve my dream physique! Music helps motivate me when I&apos;m not feeling too excited about the workout. It also helps me to get hyped to lift heavy weights or make cardio more enjoyable. What are your favorite genres to work out to? I listen to different genres depending on what I&apos;m doing at the gym. If I am lifting heavy, I&apos;ll probably listen to metal or alternative. If I&apos;m doing a fast-paced workout, then I prefer rap. If I&apos;m doing cardio and abs, then it&apos;s R&B.